Most of us don’t give mouth germs a second thought since we brush twice a day, floss nightly, and attend routine preventive dental visits every six months (RIGHT?!). But if you wear a retainer, clear aligner, or bite appliance, you may need to take extra precautions to prevent tiny invaders from taking over. Researchers have found that Candida (a type of yeast) and Staphylococcus, both potential illness-causing microbes, are present on 50% of all retainers. YIKES! 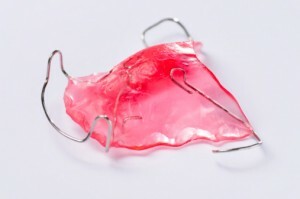 Rinse your retainer with warm water after removing it and before putting it back in. Each night, gently brush your retainer with a tiny amount of toothpaste. Soak your retainer in denture cleaner or a specially designed product, such as DentaSoak or SonicBrite, twice a week. Never boil you retainer! The extreme heat from boiling will warp the custom fit. Avoid alcohol-based mouthwashes and denture cleaners. They can dry out your retainer causing it to crack. Don’t forget your retainer case! Make sure to clean it well, too. It’s best to keep your retainer clean from the start. Candida and Staphylococcus both live in a slime layer (ewwww!) that can be difficult to remove once attached. If you still see plaque build-up or your retainer smells yucky after a thorough cleaning, talk to your orthodontist or dentist. A professional cleaning might be required. Next Next post: April Is National Cancer Control Month!